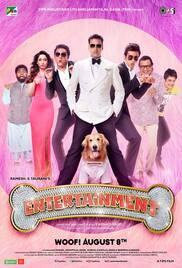 Plot: Entertainment stars Akshay Kumar, whose character is the sole heir to his father's property. However, things take an unexpected turn when someone else enters the picture - a dog named Entertainment. The two start battling it out for the property, leading to a series of hilarious events!